ONESuit® Hazmat & Chemical protective Clothing has become the Clothing of Choice for First Responders and Chemical Safety Teams. ONESuit® protective suits and gloves including ONESuit Flash, ONESuit Gard, ONESuit Shield, ONESuit Pro and ONEGlove combine uncompromised protective quality with exceptional comfort. The Entire ONESuit range was engineered to meet the needs of hazmat professionals seeking the highest levels of protection. The ONESuit Protective qualities have recently been featured in the Australian magazine "Safety Solutions" showcasing the effective protection offered by ONESuit to First Responders and Chemical Safety Teams around the world. TheONESuit® product line is comprised of high performing chemical hazmat protective suits and gloves certified to the world's most stringent standards. The ONESuit® product line is very lightweight, designed for maximum user comfort, has twice the life cycle of other suits, has a 7 to 15 year shelf life depending on the product, is reusable and decontaminable and is used by fire departments and defence forces all over the world. · ONESuit® Flash - Certified to NFPA 1991 plus flash fire protection, this single-skin, lightweight protective garment protects against chemical and biological agents in both liquid and vapour form. · ONESuit® Gard is engineered to meet the protection and comfort needs of those working in dangerous environments. NFPA 1991 certified. 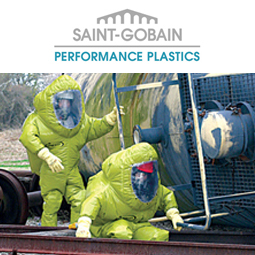 · ONESuit® Pro is the latest innovation in single-skin hazmat suits from Saint-Gobain Performance Plastics, allowing for excellent manoeuvrability and user comfort. NFPA 1991 certified. · ONESuit® Shield offers a single skin construction that is lightweight, comfortable to wear and is designed with a face mask interface. This suit also has twice the lifespan of other suits. NFPA 1994 certified. · ONEGlove® is the revolutionary protective glove that combines incredible dexterity with superior protection against cuts and punctures, chemical/biological agents, industrial solvents and chemicals, and flash fires. Elliotts is one of Australia's most trusted manufacturers of quality safety gear. Learn more about the Elliotts range of Safety Gloves, PPE- Personal Protective Equipment, PPC- Personal Protective Clothing and Welding Safety Gear online at www.elliottaustralia.com or call our Customer Service team 07 3265 2944.